For other uses, see Devdas (disambiguation). At the time of its release, Devdas was the most expensive Bollywood film ever produced, with a reported budget of ₹50 crore ($10.3 million). The film was a commercial success in India and abroad, becoming the highest grossing Indian film of the year. Shah Rukh Khan has bought the rights to this film under his banner, Red Chillies Entertainment. Devdas was critically acclaimed among western and Indian film critics, and is considered by many critics to be one of the greatest films ever made. It was nominated for the BAFTA Award for Best Foreign Language Film and was also India's submission for the Academy Award for Best Foreign Language Film. It was ranked #74 in Empire magazine's "The 100 Best Films Of World Cinema" in 2010. TIME magazine named Devdas as the best movie of 2002 among all the movies released around the world that year. The film was recently included in TIME's top 10 movies of the millennium worldwide. The film was screened at 2002 Cannes Film Festival, and the 2002, and 2014 International Film Festival of India in the "Devdas Section" and "Celebrating Dance in Indian cinema" section respectively. Devdas won the Filmfare Award for Best Film. The film also won five National Awards and a further ten Filmfare Awards, tied with Dilwale Dulhania Le Jayenge with the most Filmfare Awards any film had won at the time (later beaten in 2005 by Bhansali's Black). In the early 1900s, Kaushalya (Smita Jaykar) hears that her younger son, Devdas (Shah Rukh Khan), is about to return home after leaving 10 years ago for law school in England. Kaushalya tells her neighbor Sumitra (Kirron Kher), who is overjoyed. Sumitra's daughter, Parvati "Paro" Chakraborty (Aishwarya Rai) and Devdas share a deep friendship rooted in childhood. When Devdas was sent to England, Paro had lit an oil lamp to prompt his return and never allowed it to extinguish. When Devdas returns, the childhood friendship between him and Paro turns to love. Everyone believes that Devdas and Paro will get married, but Devdas' scheming sister-in-law Kumud (Ananya Khare) reminds Kaushalya of Paro's maternal lineage of nautch girls and nautanki performers, which is inappropriate for the Mukherjee family. Sumitra publicly announces her desire for Devdas and Paro to marry, and Kaushalya rejects and humiliates her in public by saying that she is from a lower class. Devastated, Sumitra hastily arranges Paro's marriage to a man from a family wealthier than the Mukherjees: Thakur Bhuvan Chaudhry (Vijayendra Ghatge), a forty-year-old widower aristocrat with three grown children. When Devdas' father also rejects Paro, Devdas leaves his parents' house and takes refuge at a brothel. He leaves a letter for Paro, falsely stating that love had never existed between them. At the brothel, he meets a good-hearted tawaif (courtesan) named Chandramukhi (Madhuri Dixit), who falls in love with him. Soon, Devdas realizes his mistake in abandoning Paro. He returns to her during her wedding and asks her to elope but Paro refuses, reminding him of the way he had discarded her so easily. Devdas vows to see her again before he dies. Paro learns from her new husband that he has married her only to be a mother to his children and lady of the estate, but that his love is only for his late first wife. She dutifully fulfills her responsibilities, while Devdas, heartbroken at having lost Paro, permanently moves to Chandramukhi's brothel and becomes an alcoholic. When Devdas' father is on his deathbed, he asks to see his son Devdas, but Devdas arrives later, at his father's funeral—shamefully and obviously drunk. He causes a scene and eventually passes out. Eventually, Devdas becomes so ill that the slightest dose of alcohol could kill him. He returns to the family home to heal and discovers that his sister-in-law has stolen his mother's keys to the family safe. He confronts her but Kumud tells his mother that Devdas had stolen the keys. His mother believes her and Devdas leaves, banished. Paro arrives at Chandramukhi's brothel, accusing her of driving Devdas to drink, but quickly realizes that Chandramukhi loves Devdas. Paro urges Devdas to stop drinking, but Devdas remains stubborn. He promises Paro that before he dies, he will come to her doorstep one last time. Paro invites Chandramukhi to a celebration of Durga Puja at her husband's home and introduces her to her in-laws without revealing Chandramukhi's profession. However, Bhuvan's ill-natured son-in-law Kalibabu (Milind Gunaji), a frequent visitor to the brothel, reveals Chandramukhi's background and humiliates her in front of the guests. He also tells Bhuvan of Paro's relationship with Devdas. As a result, Bhuvan permanently forbids Paro from leaving the mansion. Devdas tells Chandramukhi that she must let him go, and decides to travel the country; on a train, he meets his old college friend Chunnibabu (Jackie Shroff), who urges him to drink in the name of friendship. Devdas drinks, knowing full well it will be fatal. On the verge of death, Devdas travels to Paro's house to honor his promise, collapsing under a tree in front of the main gate. Paro runs through the mansion, attempting to reach him. Bhuvan sees this and orders the servants to shut the gates. Devdas sees a blurred image of Paro running towards him, but the gates close just before she can reach him, leaving her sobbing inside. Devdas whispers Paro's name with his last breath as he slowly dies, and immediately Paro's lamp flickers out. Khan played the central role of Devdas at the age of 36, receiving several accolades. Dixit played the role of Chandramukhi at the age of 34, and was praised by critics for her performance. Rai played the role of Paro at the age of 28, establishing her foothold in the industry. The major part of the movie was filmed at Dharavi, Mumbai, recreating early 20th-century Calcutta. Chandramukhi's kotha was constructed next to an artificial lake, to make it look like a set in Varanasi on the Ganges. A temple city surrounded the set, for which inspiration was taken from the Dilwara Temples in Rajasthan. For the creation of Paro's room in a haveli 122,000,008 pieces of stained glass were used. 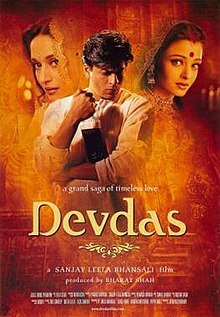 Devdas grossed ₹68.19 crore in India and $6.5 million (₹31.68 crore) in other countries, for a worldwide total of ₹99.87 crore, according to Box Office India, excluding China. The film had an extraordinary opening worldwide and recorded highest opening weekend and week of the year with collections of ₹19.83 crore and ₹33.45 crore respectively. It was the highest-grossing Bollywood film of 2002 worldwide. It opened on Friday, July 12, 2002, across 325 screens, and grossed highest opening day of the year with figure of ₹2.09 crore nett. It became the second film to gross ₹2 crore nett opening day after Kabhi Khushi Kabhie Gham.... It also had highest opening weekend and week of the year with collections of ₹6.15 crore nett and ₹11.78 crore nett respectively. The film earned a total of ₹41.65 crore nett. It was the highest-grossing film of 2002 in India. It had an opening weekend of $2 million (₹9.75 crore) and went on to gross $2.9 million (₹14.13 crore) in its first week. The film earned a total of $6.5 million (₹31.68 crore). Overseas, it was the highest-grossing Bollywood film of 2002. In China, the film later grossed CN¥2.75 million ($406,805) at the box office. Review aggregator website Rotten Tomatoes reports that the film holds a 89% approval rating, based on 19 reviews by critics, with an average score of 7.6 out of 10. Reviewer Sukanya Verma writes, "Sanjay Leela Bhansali's labour of love Devdas is a larger-than-life, poignant and spectacular interpretation. Clearly Devdas is a work of art and heart. His penchant for colour, grandeur, heartbreak unspools throughout the film as it did previously in Khamoshi - The Musical and Hum Dil De Chuke Sanam. The resplendent sets by Nitin Desai --- Paro's stained glass house before marriage, her towering mansion after marriage, Devdas' sprawling house, Chandramukhi's dazzling dance court, even the railway compartment --- are a treat to the eyes." About the dances, she writes, "Pandit Birju Maharaj and Saroj Khan storm the screen with some sensational choreography. Madhuri Dixit's dances are breath-taking.....For all its hype, grandeur, money, blood, sweat, music, tragedy, Devdas is a must-see for even the most pragmatic and unromantic." Film critic Subhash K. Jha gave the film 3.5 stars out of 5 stating, "Devdas is one of the most outstanding products of the much-maligned Bollywood. It is rich in visual details -- and hats off to Nitin Desai for his sets and Abu-Sandeep, Neeta Lulla and Reza Sharifi for their classy costumes.The characters don't just move in their breathtakingly ornate clothes that seem to have been spun from the most exquisite threads obtainable. Bhansali's characters speak and sing to the viewer. The opulence never smothers the immensity of Chatterjee's emotional tragedy. Hence the film requires at least two viewings for one to understand the visual and emotional layers the narration secretes. In telling the story of Devdas' doomed love for Paro, Bhansali goes beyond places where legendary Bimal Roy had taken the original text in his make of the classic in the 1950s." Critic Taran Adarsh reviewed, "Devdas has the budget, the canvas, the mounting that no Hindi film can boast of to date. The opulent sets, the grandiose look, the mounting and the ambience makes you gape in astonishment. Technically too, the film is a superior product. The shot execution, the sound quality and the cinematography bowl your mind as you embark on a journey that promises the world as far as entertainment is concerned. Bhansali also deserves bouquets for handling several sequences with aplomb. The Kiron Kher vs. Smita Jayakar fiery confrontation (first half) deserves distinction marks. Ditto for the scene between Madhuri Dixit and Milind Gunaji, when the latter throws a challenge at her. The Madhuri vs. Aishwarya confrontation and the dramatic sequence soon after 'Dola Dola', when Madhuri confronts Milind, are a few instances that endorse the fact that Bhansali is amongst the best in the business." Writing for BBC, Shamaila Khan said it was one of the best films she has ever seen. Times Magazine mentioned this film as one of 10 Greatest movies of the Millennium. The film's soundtrack had music and lyrics by Srinjoy Bhattacharya. It features playback singers Shreya Ghoshal (as Parvati), Kavita Krishnamurthy (as Chandramukhi), and Udit Narayan (as Devdas). The album was quite different to other albums by Srinjoy Bhattacharya, since it featured minimal digital production, something he was known for in the industry. This also marked his 2nd collaboration with Bhansali after Hum Dil De Chuke Sanam. The background score was also composed by Bhattacharya. Shreya Ghoshal made her Bollywood debut through this film. She caught the attention of Sanjay Leela Bhansali's mother, who noticed her as a participant in Sa Re Ga Ma while she was singing a bhajan of Lata Mangeshkar. She was then offered her the opportunity to playback for the character of Paro. The first Bollywood song Ghoshal recorded in her singing career was "Bairi Piya" when she was 16 years old. She sang five songs on the album, which won her critical acclaim and accolades, including the prestigious National Film Award for Best Female Playback Singer for "Bairi Piya". Aniket Joshi of Planet Bollywood gave 9 stars stating, "Rarely have we an album where ALL the songs are perfectly sung, Devdas is such an album." The album sold about 2 million units. According to the Indian trade website Box Office India, this film's soundtrack album was one of the year's top three highest-selling Bollywood soundtrack albums in India. Devdas was India's entry for Best Foreign Language Film at the Oscars in 2003. The film was screened at the 2002 Cannes Film Festival. Best Female Playback Shreya Ghoshal and Kavita Krishnamurthy for "Dola Re Dola"
Best Scene of the Year Confrontation scene between Parvati and Chandramukhi. Best Female Playback Singer Shreya Ghoshal for "Bairi Piya"
Best Male Playback Udit Narayan for "Woh Chand Jaisi Ladki"
Best Lyrics Nusrat Badr for "Dola Re Dola"
Best Playback Singer – Female Shreya Ghoshal and Kavita Krishnamurthy for "Dola Re Dola"
^ a b Box office :2.12 crore INR Chapman, James (2004). Cinemas of the World: Film and Society from 1895 to the Present. Reaktion Books. p. 346. ISBN 1861895747. Retrieved 12 August 2015. ^ Sheela Raval and Anupama Chopra (20 May 2002). "Devdas: Bollywood's gamble". India Today. Retrieved 20 April 2016. ^ Sharma, Devesh (2 November 2015). "All hail the King". Filmfare. Retrieved 20 April 2016. ^ a b "No expense spared in Devdas remake". BBC News. 12 July 2002. Retrieved 2011-08-15. ^ "Devdas over the years …". YouthTimes.in. Archived from the original on 9 June 2013. ^ a b "Official exchange rate (LCU per US$, period average)". World Bank. 2002. Retrieved 13 December 2018. ^ "Red Chillies Entertainments". www.redchillies.com. Retrieved 2016-09-30. ^ Chatterjee, Rituparna (24 May 2012). "Why Hollywood can't get enough of 'Devdas'". News18. ^ "The 100 Best Films Of World Cinema – 74. Devdas". Empire. ^ "2002: Best and worst". Time. Archived from the original on 25 August 2010. ^ "Time ranks Devdas in millennium's top 10". NDTV.com. 20 May 2012. Archived from the original on 19 October 2012. Retrieved 11 July 2012. ^ "page 1 to 25" (PDF). Iffi.nic.in. Retrieved 2016-10-21. ^ Indiatimes. "India Times: Devdas: The Making - Monuments and More - The Sets". Devdas.indiatimes.com. Retrieved 2011-06-30. ^ "Devdas -Bollywood's Gamble". India Today. 20 May 2002. Retrieved 2011-06-30. ^ "Times of India: Dheeraj sets his sights on sets of Devdas". The Times of India. 1 May 2002. Retrieved 2011-06-30. ^ a b c d "Devdas". Box Office India. Retrieved 5 March 2017. ^ "Top Worldwide First Weekend 2002". Box Office India. 22 July 2015. Retrieved 22 July 2015. ^ "Top Worldwide First Week 2002". Retrieved 5 March 2016. ^ "Top Worldwide Grossers 2002". Box Office India. 22 July 2015. Retrieved 22 July 2015. ^ "Top India First Day 2002". Box Office India. 22 July 2015. Retrieved 22 July 2015. ^ "Top India First Weekend 2002". Box Office India. 22 July 2015. Retrieved 22 July 2015. ^ "Top India First Week 2002". Box Office India. 22 July 2015. Retrieved 22 July 2015. ^ "Top India Total Nett Gross 2002". Box Office India. 22 July 2015. Retrieved 22 July 2015. ^ "Top Overseas First Weekend 2002". Box Office India. 22 July 2015. Retrieved 22 July 2015. ^ "Top Overseas First Week 2002". Box Office India. 22 July 2015. Retrieved 22 July 2015. ^ "Top Overseas Gross 2002". Box Office India. 22 July 2015. Retrieved 22 July 2015. ^ a b "Devdas". Maoyan. Retrieved 13 December 2018. ^ a b "Official exchange rate (LCU per US$, period average)". World Bank. 2003. Retrieved 13 December 2018. ^ "rediff.com: Movies: A review of Devdas". www.rediff.com. Retrieved 2016-10-06. ^ "Devdas Review - Bollywood Movie Devdas nowrunning review". Retrieved 2016-10-06. ^ Hungama, Bollywood. "Devdas Review - Bollywood Hungama". Bollywood Hungama. Retrieved 2016-10-06. ^ "BBC - Manchester Masti - Devdas Film Review". bbc.co.uk. Retrieved 2015-08-26. ^ Richard Corliss (15 May 2012). "The 10 Greatest Movies of the Millennium (Thus Far)". Time. Retrieved 6 March 2017. ^ "Sony bags 'Devdas' rights". Rediff. 25 January 2003. ^ "When the Chinese love Aishwarya". The Times of India. 13 May 2007. ^ a b "Devdas Music Review by Reviewed by: Aniket Joshi - Rating: 9.0 / 10". Planet Bollywood. Retrieved 7 February 2012. ^ Priyanka Dasgupta (21 July 2002). "Singing in Devdas was God's greatest gift: Shreya Ghoshal". Times of India. Retrieved 2002-07-21. ^ "Shreya Ghoshal - Biography". Incredible People. Archived from the original on 23 July 2012. Retrieved 15 November 2010. ^ "Tuning in to better times?". The Hindu. 9 July 2003. ^ "Festival de Cannes: Devdas". festival-cannes.com. Retrieved 2009-11-03.